A Premium Acrylic, Very High Opacity, White, Non Spatter Formula for Ceilings. 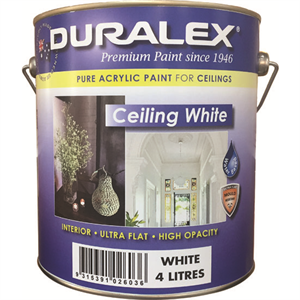 Duralex PREMIUM CEILING WHITE is a premium quality, extra white, heavy bodied, high opacity paint specially formulated to reduce drip and spatter during application. It is an ultra flat finish thus hiding small imperfections in ceilings. 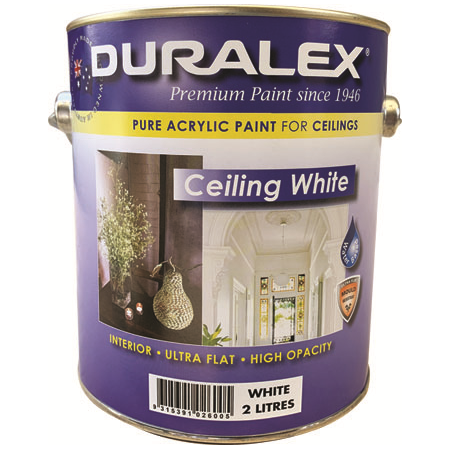 Specifically formulated for interior application to ceilings in bedrooms, loungerooms, etc. Available in White only. For tinting, use normal additions of colourants for pastel colours. Sizes 1 Litre, 2 Litre, 4 Litre, 10 Litre, 15 Litre and 20 Litre. Coverage A maximum coverage rate of 14m² per Litre. 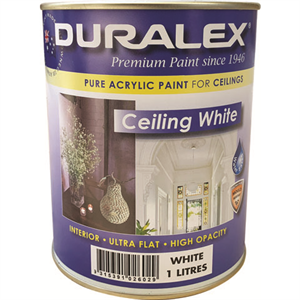 This may fall below 10m² per Litre when painting rough or absorbent surfaces.